North of Asheville just passed Weaverville, we set out for the eagerly anticipated Echoview Farm 2nd Annual Hop Festival. We were privileged to attend last year’s successful event, and this year was equally successful. As we entered, we picked up our reusable bags complete with literature and tasting glasses. 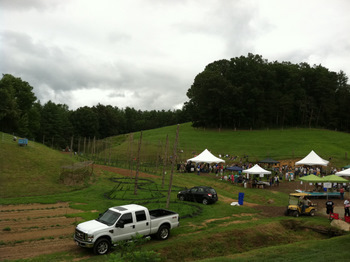 This year, Echoview Farm provided several home brews made exclusively with Echoview hops; our favorite was the brown ale. Pisgah and Asheville breweries were also on hand. The food tent supplied hot dogs, bratwurst and veggie dogs with all the trimmings. Music was provided by the award winning High Windy bluegrass band. We enjoyed some hops Q&A with Stacy the grower. With multiple varieties, including Cascade, Centennial, Magnum and Brewers Gold, we learned the challenges of growing hops in this climate. The complexity of soil pH, nutrients, temperature and rain are but some of the challenges to growing hops in western North Carolina. The concept of buying local produce and goods is well known in these parts. For one thing, it just makes sense that when dollars don’t leave, they get reinvested in the community. There is also a sense of connection to those that live and do business together. Echoview Farm certainly understands this. As the craft beer brewing industry in the greater Asheville area exploded, the need for hops and malt became greater. A few savvy individuals like Julie Jensen saw this need and set out to fill the niche. With a commitment to sustainable farming, Echoview Farm is setting a good example of how modern farms should operate. Ironically, it’s how many farms in the “olden days” always farmed. 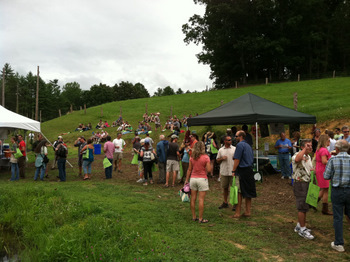 We wish Echoview Farm continued success and look forward to next year’s event.